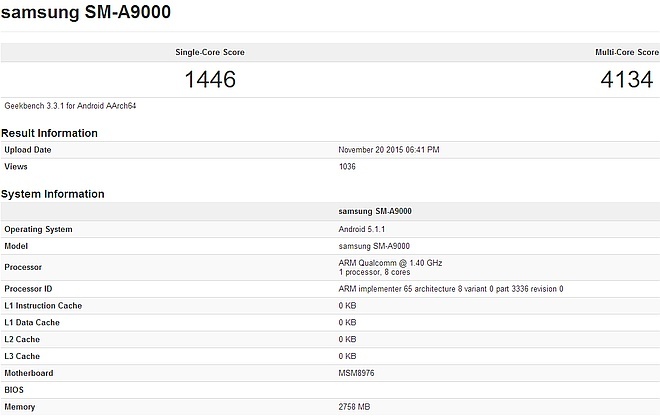 The SM-A9000 model spotted recently is driven by a Qualcomm Snapdragon 620 SoC and runs Android 5.1.1 Lollipop. Samsung Galaxy A9 has been spotted for the first time back in March when a few details were revealed by a trademark filing. In the meantime, we did not hear much about it, but it looks like this handset is finally close to its official unveiling. However, nothing is official yet, but since it has been spotted on Geekbench, it will probably launch just in time for this year's holiday shopping season. 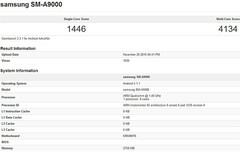 On Geekbench, the Samsung SM-A9000 appears to be the same device that has also been spotted on AnTuTu last month, both featuring the same chipset and model number. Although it is possible to see variants with other processors as well, this Samsung Galaxy A9 model features a Qualcomm Snapdragon 620 SoC and runs Android 5.1.1 Lollipop. Its Geekbench results are 1,446 for single core and 4,134 for multi-core tests. Since the updated Galaxy A3, Galaxy A5, and Galaxy A7 are all expected to hit the market soon, the Galaxy A9 will probably follow them. Next time, we should see it reaching the FCC, so stay tuned.